Hi friends! 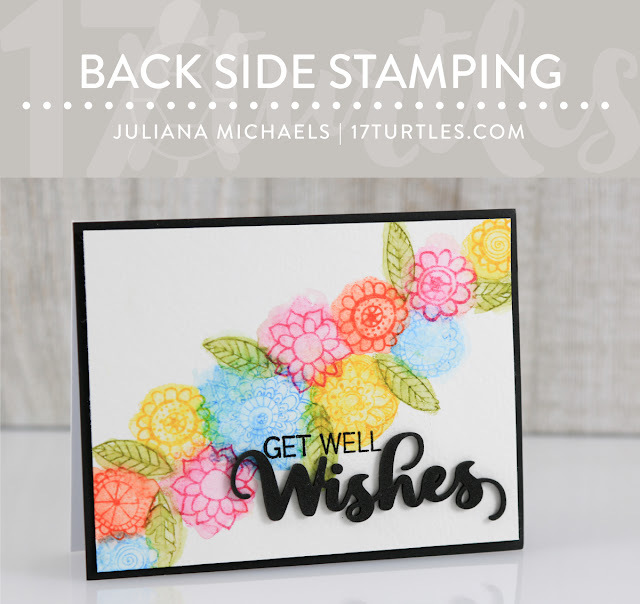 Today I'm sharing how to use the back side of your clear stamps for a floral watercolor card I created for the CardMaker and Impression Obsession Blog Hop. You'll find all the blog hop details below. First though, I invite you to check out this fun technique to help you stretch your stash of stamps! 1. Gather your supplies: Scrap paper, watercolor paper, clear stamp, stamping block, Distress Ink, small paint brush, water. 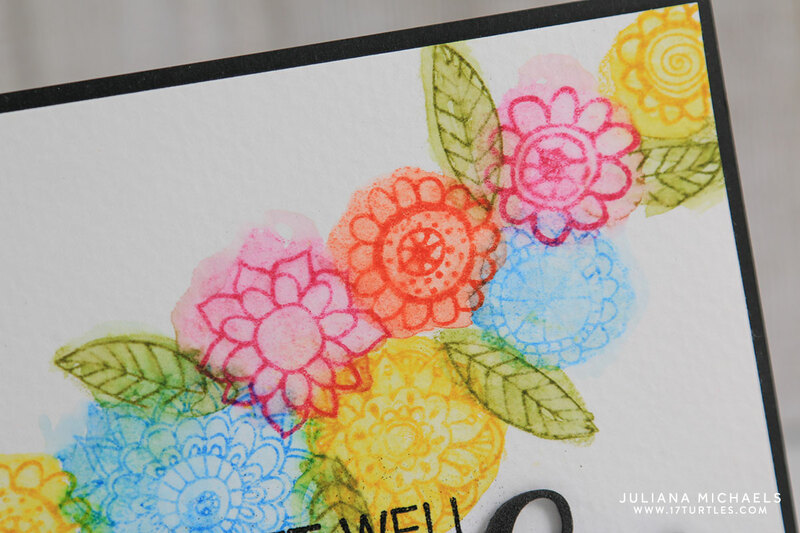 For this card, I'm using the Doodles Flowers stamp set by Impression Obsession. You can find a full detailed list of the supplies I used below. 2. 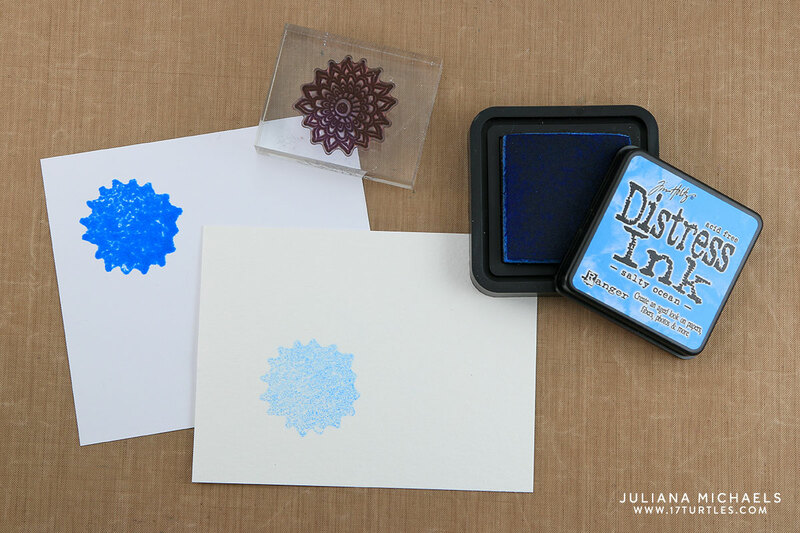 Place your stamp backward onto your stamping block. 3. Ink your stamp and stamp it onto the scrap paper to remove some of the ink. 4. Stamp the image onto the watercolor paper. 5. 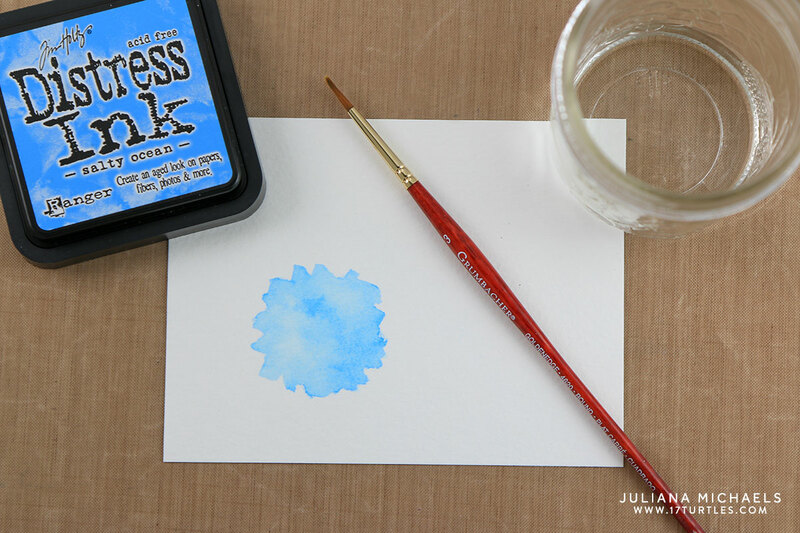 Use a small paint brush and water to blend the ink and achieve a watercolor effect. 6. Allow this to dry. You can speed up the drying process with a heat gun if you are in a hurry. 7. Clean your stamp and place it right side up on your stamping block. 8. Apply ink and stamp image on top of the first image. 9. Allow this to dry. 10. Repeat this process with each flower. Tip: I recommend doing a test stamp for each color you select. Some inks become too light when you off stamp them, so you may need a darker color to use when you stamp the actual image. There you have it...a fun and simple way to stretch your stash of stamps! 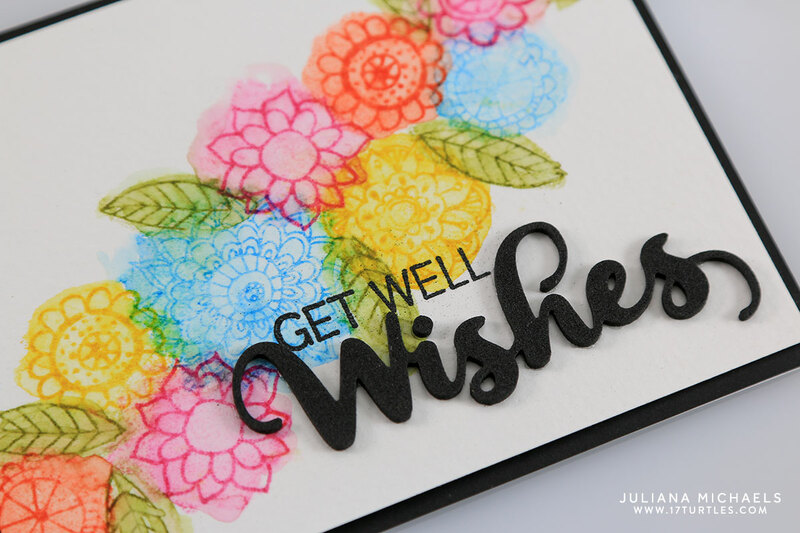 For the sentiment, I stamped "Get Well" and heat embossed it with black embossing powder. The word "Wishes" is die cut from black Fun Foam. I love how this adds a little dimension to the card without adding a lot of bulk. And now for the good stuff...Impression Obsession is hosting a giveaway! Make sure to leave a comment on each blog for your chance to win a $25 gift certificate to their shop. Comments will be open until Sunday, September 4th and the winner will be announced on the Impression Obsession blog on Monday, September 5th. Happy Hopping! Great tutorial and beautiful card, Juliana! Pretty card, I like this technique! Love your beautiful card. thanks for sharing the technique. Your card is beautiful, I love the bright and pretty colored flowers. Such a pretty card! I especially like the way you off stamped the flowers. And, I do love the script used with your sentiment. I think I must buy that one! Thanks for sharing this fun technique. gorgeous card! and I love your technique! I am going to have to try that! Very creative. I'll have to try this technique out. Thanks for sharing. Just a lovely card. Love this idea. Looks so soft. This is so pretty! What a great water color technique too! Beautifully done and so creative, looks like a fun technique! How fun!! Thank you for sharing this technique!!! Great technique and so easy. Thank you. Great idea, thank you for sharing with us, and love the card you made...very clever idea. I would never have thought of using the back of my stamp and then overstamping with the front of the stamp! Thanks for the great idea. I love the colourful, playful look of this card! Thanks for sharing this cool technique. What a great idea. I need to try that. Your card is beautiful. Great coloring technique! Love it! 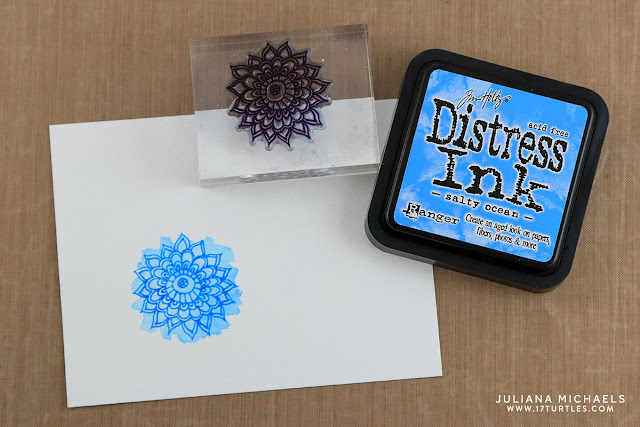 Wonderful way to stretch a stamp! Love this pretty card. Great technique and such pretty colors. Love those pretty flowers! Beautiful card with great colors! Love this technique. Will definitely have to try it. Stamps are so cute. Thanks for sharing this watercolor technique I'm going to try it with my set of leaf stamps. Should make a nice Fall card. Perhaps I just found how to make my Thanksgiving cards. Thanks again for the idea. What a fun way to use stamps! And the use of foam for the sentiment is great! Not here for the hop...but because I haven't called on by for a wee while! Love that technique which I have NEVER thought of doing. Looks fabulous on your finished card:) And I saw some foam today....then put it back. Dang it all! Shoulda BOUGHT it!!!! Love this gorgeous color! It's so cheerful and bright! Thanks for showing us a fun technique! Isn't it amazing how one can always find something new and different on these hops? I had never seen this stamping technique done before. Too cute. And I love die cutting the word in foam. Thank you. Thanks for the great tutorial. I think some of my middle school students would enjoy making a card like this for Mother's Day. Well done. Lovely card. What a clever idea! I am going to have to try out this technique. Thanks for the inspiration. Beautiful card! I love how this turned out. I have never tried this technique but want to now! :) Thanks for sharing.